The ancient Mayan civilization influenced future empires and even the world as we know it today. But who were the ancient Mayan people? How did Maya history impact Aztec history? Let's find out! Much of Maya history is shrouded in mystery. It is believed today that the Mayan peoples began to settle in the Yucatan area of what is now Mexico between 2600 BC and 1800 BC. As the centuries rolled on, their culture and religion developed. What truly originated with the ancient Mayan people and what came from other peoples in the area we may never know for sure. What we now call the Mayan empire really came into its own between 250 AD and 900 AD. Large-scale construction was taking place, and major cities developed. Like the Aztec civilization that was to come later, the ancient Mayan civilization was based around city-states. 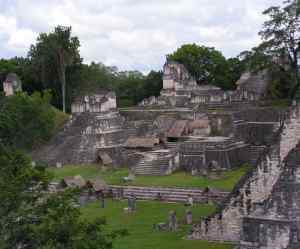 Some of the major cities were Tikal, Copan, Chunchucmil, Bonampak, and Palenque. Long distance trade was developed, and the famous Mayan pyramids (temples) were built. The ancient Mayan people continued to develop the art, maths and science that they are famous for even today. Further south than the Aztecs would be, the Mayans dominated what are now the Mexican states of Chiapas, Tabasco, and most of the Yucatan. The empire also stretched through northern Central America, including Guatemala, El Salvador, western Honduras, and Belize. 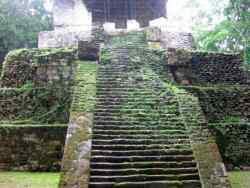 I had the privilege of visiting one of the largest Mayan cities many years ago - now called Caracol, in Belize. It is estimated that 200,000 Mayans lived here during the height of the city's power (around 700 AD). The great Caana complex there is still the largest man-made structure in Belize. Below is a picture I took several years ago - today the complex has been cleared off and can be seen in full. Check Caracol.org for current photos and more about this part of the ancient Mayan civilization. There is much debate over why the empire declined in the 8th and 9th centuries. Was there an environmental disaster? A drought? Climate change? Or was it a disease, or overpopulation? All these theories are popular. Maybe it was a combination of these things. Mayan peoples were to pay tribute to the Aztec empire many years later. But the culture of the Mayans was to influence the Aztecs in many ways. Again, we don't always know what originated with the Mayans, and what was just general culture of the area over the centuries. We do know that the Aztecs shared the Mayan love of the cacao (chocolate) bean. They would also use chewing gum as the Mayans did, use the same base-20 mathematical system, and worship many of the same gods (though re-invented to suit Aztec society). The ancient Mayan people had remarkable insight into mathematics and astronomy, and other sciences such as medicine. It's likely that the Mayan influenced many peoples of Central Mexico, and eventually the world. For more on the ancient Mayans, visit the Native American Indian Resources site.